Head to Bob Evans (or Mimi’s Cafe) for buy one, get one free entrees (plus the purchase of two drinks) now through May 31. Some days you just don’t feel like cooking. Whether it’s breakfast in the morning or dinner after work, sometimes it’s just hard to muster the energy. For one of those days, whether it’s morning or night, we’ve got you covered. Bob Evans has a coupon for a buy one, get one free breakfast entree through May 31. Choices for the BOGO offer include the Farm-Fresh Egg Combinations, Bob Evans Sausage Classics, Sweet & Savory Combinations, Stuffed 3-Egg Omelettes, Hot off the Griddle and Sweet & Stacked Hotcakes options. There are some seriously tasty breakfasts on that list, so click here for the coupon and here to find the Bob Evans nearest you (there are more than 600 locations in 19 states). Oh, and don’t forget, the purchase of two drinks also is required to get the free entree. 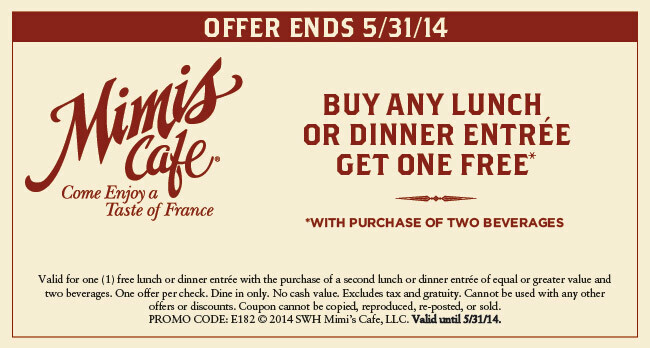 Meanwhile, Mimi’s Cafe has a BOGO offer of its own that has similar terms. It’s also good through May 31, good for dine-in only orders and requires the purchase of two drinks. However, the Mimi’s offer is good for lunch or dinner, so whether you need a midday or post-work break from the stove, you’re all set. Click here for the coupon. Freebies to keep your kids’ minds fresh this summer. Free museum entry for active military members and their families all summer.